In the later times of the Covenant-Human War, tactics were becoming more bold and desperate. Sangheili zealot Krig-Yoss 'Taur was commanding a Wraith in a blitz-style operation and grew deeply irritated with the poor mobility and speed of the ubiquitous tank. UNSC forces were staging a strategic retreat and 'Taur knew that if heavy firepower could keep up, the retreat could be converted into a slaughter. At wit's end, 'Taur abandoned his Wraith (and gunner) and tackled the operator out of a passing Ghost, commandeering the small vehicle. He charged straight forward at full boost, but with heavy armor falling hopelessly out of range to his rear, he was unable to turn the tide of the battle. The UNSC forces completed their retreat, regrouped and joined with fresh reinforcements. 'Taur would not accept further embarrassment caused by what he felt was ineffective ground vehicle design. The Revenant, of course, was suggested as a solution to his problem, but he dismissed those as hampered by excessive compromises. 'Taur used his command influence (and rage) to commission the rush development of a new ultralight tank. The requirements were: 1) The ability to maneuver as well as a Ghost while 2) packing the most destructive power per shot into a regenerating-shot canon physically possible under the constraints of 1). 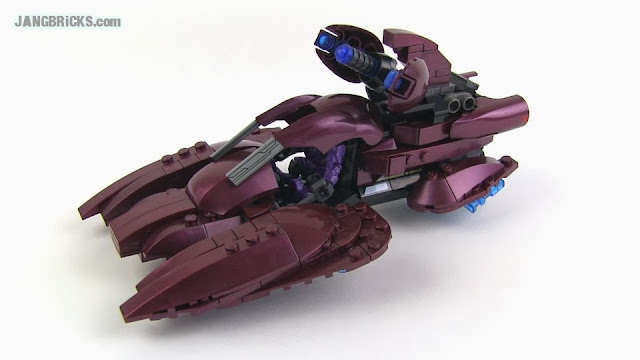 The result was the Ghast, a single-seat speed demon with more firepower than a Revenant and higher straight-line speed, with strafing performance on par with a Ghost. Less than 40 Ghasts saw battle before he war came to an end.